Marine propulsion is a mechanism or system used to generate thrust to move a ship or boat across water. Battery packs are used for propulsion/voyage in hybrid and full electric marine propulsion systems. In hybrid marine vessels, battery as well as alternate fuel such as diesel and LNG are utilized during propulsion of the vessel. In full electric marine vessels, 100% propulsion is made through the usage of rechargeable battery packs. The year-on-year growth in inter-state, intra-state, and cross-border trade activities has triggered the demand for marine ships. Rise in number of marine ships for several operations inside and outside a country has boosted the demand for fuel-efficient marine propulsion systems. Increase in usage of ferries for transportation purposes in coastal waterways is driving the demand for hybrid and full electric marine propulsion system. New/converted hybrid/full electric ferries play an important role in public transport systems in many waterside cities and islands. Implementation of strict regulations around the Emission Control Areas (ECA) across the globe has boosted investment in marine hybrid propulsion systems. Stringent regulations pertaining to carbon emissions and oil spillage have augmented investments in the development of fuel-efficient marine propulsion systems. Better fuel-efficient marine propulsion components such as generator and motors are being developed by companies operating in the market. Various ship operators are utilizing renewable energy (including solar energy) as storage option in hybrid propulsion systems. Stored solar energy is used during peak hours or at night in marine propulsion systems. This eliminates the round-the-clock need for conventional marine fuel. Hence, a shift toward usage of hybrid propulsion units is estimated to take place in the near future. Furthermore, governments of several countries are funding and supporting development and adoption of the latest technology in marine propulsion systems. Various ship operators are utilizing renewable energy, including solar energy, as storage option in hybrid propulsion systems. Diesel is the preferred fuel for marine transport. Its price is directly proportional to the price of crude oil. Volatility in prices of crude oil has resulted in a switch from diesel to other propulsion systems. The relatively low price of natural gas and LNG compared to diesel in North America and Europe has attracted investments in LNG infrastructure in these regions. This can also affect diesel-electric based hybrid marine vessels. Hybrid and full electric power based new/converted marine fleet is likely to expand at a rapid pace during the forecast period. In November 2018, Wartsila Corporation expanded its Smart Marine portfolio with the addition of high-speed, compact engine that is ideal for hybrid installation. In December 2018, Rolls-Royce Plc. received approval in principle (AIP) for hybrid tug propulsion system. The AIP was granted following an evaluation of the world’s first hybrid tug, a unique vessel designed by Jensen Maritime and will be delivered to Baydelta Maritime LLC in February 2019. In July 2018, Cummins Inc. acquired EDI, a provider of electric and hybrid powertrains. Efficient Drivetrains, Inc. (EDI) designs and produces hybrid and fully-electric power solutions for the commercial market. In June 2018, AB Volvo Penta announced a hybrid concept for its IPS propulsion. The hybrid system includes Volvo diesels, electric motor drive, and an energy storage system (lithium batteries) that is designed to produce zero-emission propulsion. In December 2017, Caterpillar Inc. collaborated with Sanmar Shipyards in Istanbul, Turkey, to build an innovative tugboat with a hydraulic hybrid propulsion system. The company’s Cat Marine Advanced Variable Drive (AVD) is utilized for hydraulic hybrid propulsion system. In November 2017, Caterpillar Inc. announced it had entered into a contract to supply an integrated hybrid propulsion solution on two new vessels for Harbor Docking and Towing based in Houston, Texas. The two new vessels will be designed and built by Washburn & Doughty in East Boothbay, Maine, the U.S. Currently, Europe and Asia Pacific are the key regions of the hybrid and full electric marine propulsion systems market. 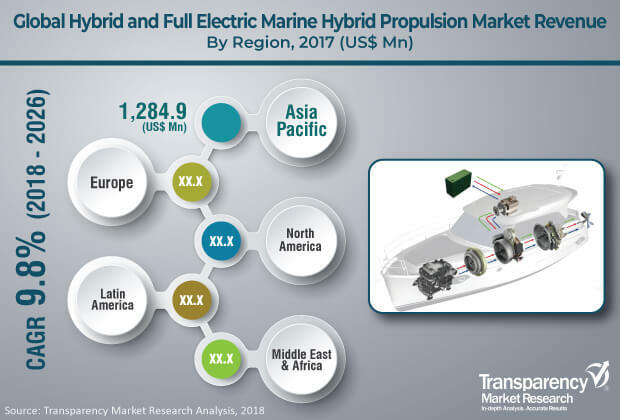 Highly environment-conscious Europe and North America are projected to lead the global hybrid and full electric marine propulsion market in the near future. On the other hand, the hybrid and full electric marine hybrid propulsion systems market in Asia Pacific is dominated by ASEAN. Numerous attractive technologically advanced models are expected to be introduced across the globe in the near future. The hybrid and full electric marine propulsion market is projected to witness a large number of collaborations between vessel operators and technology developers in the next few years. The global hybrid and full electric marine propulsion market is highly competitive. Leading players dominate the market. Key players operating in the hybrid and full electric marine propulsion market are Cummins Inc., Caterpillar Inc., AB Volvo Penta, BAE Systems, Wärtsilä Corporation, Rolls Royce Plc., Niigata Power Systems Co., Ltd., Fairbanks Morse Engine, Masson-Marine S.A.S., GE, STEYR MOTORS GmbH, MAN Diesel & Turbo SE, and Torqeedo GmbH.